But the hairy barbarians aren't just fooling around at the fish market. I went to say hello to the Daibutsu recently (a magnificent 750 year old 35ft high cast bronze statue that has outlasted the building within which it was originally housed), and what should I see but a handful of Brits climbing all over him, complete with handlebar moustaches and umbrellas! I seem to have missed out several months of Corbynwatch. In fact my last post appears to have been early Sept, concerning his August forecast. To be honest I was getting a bit bored by then, and was also suspicious of his methodology of only sending out his forecasts a few days into the month, and sometimes not at all. But he did send out the October forecast, and turned out to get it right overall (amusingly, he predicted a cold first half and milder second half, whereas reality produced the exact opposite - nevertheless, on the monthly figures his overall estimate of -0.2 to -1.2C captured reality's -0.6C, and the very average rainfall was also in the middle of his range). So that got his score up to a reasonable 10 out of 16. November, on the other hand, was a complete bust. His forecast was for very cold (at least -1C compared to the long-term mean) and wet (130-200% of normal) month, but it turned out slightly mild (+0.1C) and slightly dry (90%). I never saw a December forecast, so his final score for the year score sticks on 10 out of 18. (with only 9 forecasts available). If his accuracy really was the claimed 80%, such a poor result would have a less than 2% probability of occurring. Piers and colleagues have placed bets of about £1,000 with William Hill and Coral for snow at various locations on Christmas Day and stand to win many thousands if they are correct. Piers whose record of weather bets is second to none* said: "We have just made a breakthrough in our 'Solar Weather technique of long range forecasting - called SWT25 - and are 75% sure there will be snow in many but not all locations offered by boookies this Xmas, and we have a fair idea of where the best bets are likely to be". This £1,000 was of course lost. He has also predicted that 2009 will be outside the top 5 years, in contradiction of the UKMO prediction. I don't have any plans to follow his forecasts in detail though - especially as there is no sign of the January prediction. 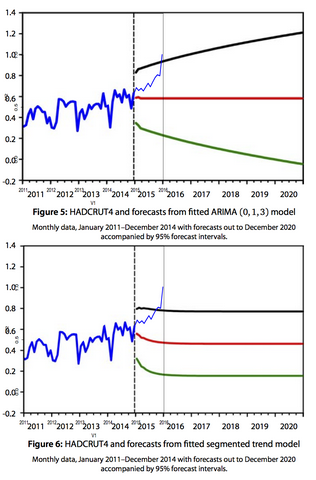 I'm delighted to report that James Hansen has come out in support of my prediction, made on the "More or Less" program last year, that we are likely to see a new record in the next few years. Specifically, Hansen has made the slightly stronger statement that "it still seems likely that a new global temperature record will be set within the next 1-2 years" (ie in 2009 or 2010, my bet also includes 2011). In a demonstration of his collegiality, Roger Pielke writes that it is "boneheaded" of Hansen to have said what he did, but IMO it is entirely appropriate for scientists to state their opinions (within their area of expertise), with their uncertainties and assumptions so clearly and concisely presented. I don't believe there is any plausible room for people misunderstanding what Hansen has said, although that probably won't stop some from misrepresenting it. Obviously the annual temperature depends a lot on short-term variability (in particular, ENSO) but that doesn't change the fact that the underlying trend is up and new maxima can be expected reasonably frequently, even if we cannot predict exactly when. It is a great example of the sorts of things that climate scientists can and cannot predict. Or so says the Guardian, but on checking, I see it is none other than my pal Andy and his colleagues at Bristol. Their point is the fairly straightforward one that since different crops have different albedo (even within a species), choosing varieties with high albedos could alter the regional and even global temperature. Not by a lot, but every little helps. And props to Oliver Morton at Nature, for managing to spell Andy's name right, unlike the Grauniad and BBC. Oliver loses credit for finding people prepared to say narky things about Andy's brilliant idea though (OK that's enough toadying for today - Ed). Anyway, after some brief thought we soon realised that Climate of the Past would be an ideal venue for the paper. So we sent the manuscript, very lightly edited for the different format and in light of the few substantive comments that had been received, and included the original reviews (after checking the GRL editor agreed) along with our responses to inform the CP Editors as to the history of the piece. The paper took some time to be posted up but now can be seen along with the first reviewer comment which seems if anything even more sharply critical of the original paper than we were. Quite by chance, a couple of weeks ago Jules spotted this comment and the response which had just appeared in GRL. Obviously this had been going through the review system at the same time as our manuscript was at GRL (their first submission predates ours by about a month), but we didn't know anything of it. It is interesting to see that they have a set of entirely unrelated criticisms, illustrating that while the truth is generally constrained to a single path, there are any number of ways of being wrong. We'll surely refer to it briefly in our revision for CP. In the meantime we still have another reviewer (maybe two) to wait for, and in stark contrst to GRL's attitude, any other relevant comments are welcome either here or there (best at CPD if you have something that impinges on the content). I'm a big fan of the EGU system where reviews are available to view and the decision making process is out in the open, and think it is especially well suited to comments where reviews may have a tendency to be polarised.